The total variation (TV)-seminorm is considered for piecewise polynomial, globally discontinuous (DG) and continuous (CG) finite element functions on simplicial meshes. A novel, discrete variant (DTV) based on a nodal quadrature formula is defined. DTV has favorable properties, compared to the original TV-seminorm for finite element functions. These include a convenient dual representation in terms of the supremum over the space of Raviart–Thomas finite element functions, subject to a set of simple constraints. 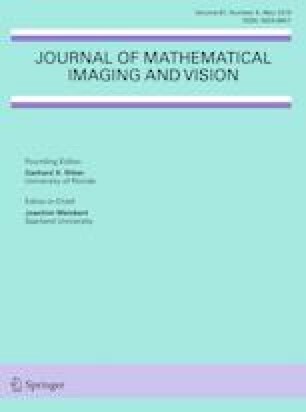 It can therefore be shown that a variety of algorithms for classical image reconstruction problems, including TV-\(L^2\) denoising and inpainting, can be implemented in low- and higher-order finite element spaces with the same efficiency as their counterparts originally developed for images on Cartesian grids. This work was supported by DFG Grants HE 6077/10–1 and SCHM 3248/2–1 within Priority Program SPP 1962 (Non-smooth and Complementarity-based Distributed Parameter Systems: Simulation and Hierarchical Optimization), which is gratefully acknowledged. The authors would like to thank Jan Blechta for help with custom quadrature schemes in FEniCS. Part of this research was contrived, while the second author was visiting the University of British Columbia, Vancouver. He would like to thank the Department of Computer Science for their hospitality. Moreover, the authors would like to thank two anonymous reviewers for their constructive comments, which helped improve the presentation of the paper.